We know what you’re thinking. It’s August, Autumn hasn’t even hit yet and I’m in the middle of the Summer rush, why would I even to begin to think (or have the time for that matter!) to plan a Christmas party for my employees? The weather may not yet have plummeted, but now is the perfect time to start putting plans in place to thank all of your employees for all of their hard work this year. But where to start? 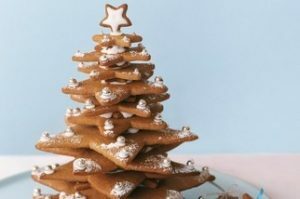 Here are our top ten tips to help guide you through the fun (and considerations) behind planning your Christmas office celebrations. There are only a limited number of Friday/Saturday dates from mid-November through to near-end December, so pick one and stick to it. Perhaps the most important element to your event, the budget will determine elements such as the food, entertainment and even any potential theming. Always communicate with your party planner (if applicable) so that they can manage expectations to create the best night possible! Do you want to venture out of stay close to home? If you’re considering a party venue that is a drive away, you may want to check that they have overnight accommodation, especially once the mulled wine gets flowing! TIP: Don’t have time for a night time event? Why not organise a Christmas lunch instead! Many venues offer Christmas lunch packages to suit all party sizes and can be just as fun! Shared parties come with the fantastic opportunity to mix with groups from other companies, allowing you to benefit from the high end production and entertainment of a big event, whereas choosing an Exclusive Christmas party can be as simple or extravagant as you wish, giving you complete control over your own event. Looking to blow your colleagues away? A themed Christmas party may be the way to go and are extremely high in demand for 2014. From Charlie and the Chocolate Factory, Winter Wonderland all the way through to Viva Las Vegas, Office Christmas has a theme for everyone. More info here. DJ and Disco, live music, magicians, dancers, awards ceremonies, stilt walkers – there are so many options to choose from! To build a truly bespoke Christmas party, check out our Party Planner tool here. How would you like the party food to be served? Three-course meals may be perfect for some, but there are other options such as Buffet or bowl food to take advantage of.Photographers, goody bags and party games can also be a great way to keep the festive party spirit going! Check any dietary requirements within your team and then send the menu to them via email. As for drink options, you will have the option of preparing a bar tab or perhaps arranging drink vouchers, choose what is best for your audience. If you’re going to a themed party, props can be the perfect way to make your office Christmas party a night to remember. Corporate Christmas parties are a great way to create unity within your business. This is especially beneficial if your company operates under a number of different departments. Just remember the number one rule….no photos after 10 pm! Need help organising the perfect bespoke Christmas party for your team? Office Christmas is always on hand to help. Just drop us an email via or call 01273 856001. Get into the Christmas ‘spirit’ with a delicious Christmas cocktail. Here are some of the Office Christmas team’s favourite Christmas cocktail recipes, one for each day of Christmas! We hope you enjoy tasting these delicious Christmas beverages. If you have a go at making any yourself we’d love to hear how you do. Send us your pics. A delicious green coloured cocktail that looks terrifying but tastes delightful! Add a cherry garnish for added Christmassy colour. 2. Mulled Wine with a Twist! With a large helping of cranberry juice, this is a great recipe for enjoying the delicious taste of mulled wine whilst avoiding a terrible hangover. Put the wine and cranberry juice in a saucepan with the orange, sugar, and the spices. Heat gently until the sugar has dissolved. Taste to see if you want the wine sweeter, and add more sugar to taste. You may well recognise this recipe as the famous ‘White Russian’, add white chocolate instead of dark to complete the snowy feel of this delicious after dinner treat. For chic sophistication at your Christmas party create a delicious Champagne cocktail reflecting the colours of this beautiful Christmas plant. This is the traditional ‘Grasshopper’ cocktail with a delicious Christmas twist! Made famous by Nana Royle this vintage Christmas treat is sure to tickle those taste buds this festive season. Great as a dinner party dessert! Place the milk, sugar, vanilla pod and eggs into a pan and heat gently on the hob, stirring frequently, until the mixture thickens enough to coat the back of a spoon – be careful not to boil the mixture or your eggs will scramble! Get ahead tip: You can chill the mixture at the end of step one and store in the fridge until ready to serve as a cold drink later in the evening. The mixture will keep for up to 24 hours. A fruity, spiced winter warmer for a cold Christmas night. A colourful cocktail to serve to a party crowd. If the main course leaves little room for pudding, try this delightful cocktail instead. A short party shot that looks the part for a festive soiree. We all love a good Christmas cracker joke, however corny. Here are a few of the Office Christmas team’s favourites. Email your Christmas cracker joke to us and we’ll post it here! What did Cinderella say when the chemist lost her photographs? Why was Cinderella such a poor football player? Because she kept running away from the ball! What food do you get when you cross a snowman with a polar bear? How did Darth Vadar know what Luke was getting for Christmas? Who looks after Father Christmas when he is ill? What Christmas drink gets on your nerves? What’s a snowman’s favourite mode of transport? You’ve booked and organised your Christmas party and now all you have left to do is decide what to wear. One small problem… you have a dress code but you’re not entirely sure what it means. In true fashionista style, here is the Office Christmas guide to dress codes. If you have any questions please leave a comment below or tweet us and we’ll offer our best advice. This is the most common dress code for Christmas parties, especially for shared events. Guests are expected to avoid overly casual clothing such as t-shirts and trainers. Jeans are deemed inappropriate for this dress code but ladies may get away with a smart pair of black jeans. Ladies: Choose a dress or a pretty top with a skirt or tailored trousers. Finish the look with a pair of heels. Gentlemen: Choose a collared shirt and jacket; a matching suit is not necessary, nor is a tie. This dress code is common for large-scale private Christmas parties held at glamorous venues. This dress code requires guests to make a special effort with their attire and choose something sophisticated. Ladies: Choose a glamorous dress and add a glitzy bag, shoes and accessories. Gentlemen: Choose a dark suit and match a dress shirt with a tie. Tuxedos are a great way to impress but ask your colleagues if they are wearing one too to avoid an awkward situation. Don’t forget to polish your shoes! Black tie is a strict dress code and guests will be expected to wear formal attire. We recommend hiring an outfit if you don’t already own something appropriate as this way you get to wear something really special without having to fork out for a hefty price tag. Ladies: Choose a ball gown or a long length dress with matching accessories. Gentlemen: Choose a tuxedo and a black bow tie. Whilst, not official dress codes, these are often used for shared parties. Guests are expected to choose something special to wear that will impress your colleagues and friends. Ladies: Choose your favourite ‘night on the town’ outfit and don’t forget the heels! Gentlemen: This dress code is not as strict as the others meaning you are free to choose any outfit; we recommend something that makes you feel smart and sophisticated. This is your chance to shine! Once you know the theme of the party you can go to town with creating your costume. Don’t forget about wigs, accessories and make-up which can really add to the overall effect. In our experience, guests approach fancy dress in groups, if one person chooses to dress-up, others will follow. Be courageous and lead the group by brainstorming ideas. Fancy dress can really add something spectacular to a themed event and is sure to make your Christmas party one to remember. So you’ve organised a fabulous Christmas party for your team; congratulations! Now it’s time to get everyone in the festive spirit, stretching the season out for as long as possible in the run up to the big event. To help, here are our top four tips for getting everyone prepared and excited for your Christmas party! It’s beginning to look a lot like Christmas…Tacky or tasteful, every office needs a bit of glitter and sparkle to really get everyone in the festive mindset. Think fairy lights above the notice boards, baubles from door handles and tinsel pretty much everywhere it won’t fall down – which is a daunting task in itself. Get everyone involved in turning your office into a magical Santa’s Grotto to remind them that with every working hour, they are one closer to their fantastic (and well organised!) office Christmas party. TOP TIP: Include a big office advent calendar to help count down the days to your party. And why not add a Christmas treat behind every Friday door such as a drink token or two for your party – a trick to get even the inevitable Scrooge excited for the festive season! The X-mas Factor! A little competition is always a good way of getting everyone involved in the Christmas festivities. Let you and your colleagues bring out your inner child with an ugly Christmas jumper competition, or show your creativity with a competition for the best-decorated desks. Competitions are also a great way of bringing the office together, helping everyone get to know each other – eliminating the slightly uncomfortable first hour of ‘mingling’ that usually comes with office parties, meaning as soon as you arrive at your beautifully themed and decorated venue the party can start immediately! TOP TIP: Why not award these competition winners with vouchers towards their party outfit or drinks vouchers for your Christmas party night? “On Your Marks, Get Set, Baaake! !” This one needs little explanation. 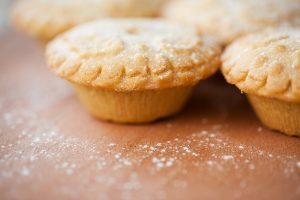 With ‘Great British Bake Off’ as popular as ever, why not incorporate this into your Office’s Christmas Countdown and get everyone baking their favourite Christmas treats and puds. It’s the perfect way to get everyone in the office involved, whether through baking or eating! In true Bake Off tradition, this can be turned into a light-hearted competition to find out who in your office secretly bakes like Mary Berry, without a soggy bottom in sight! This simple festive idea is guaranteed to be a hit in your office, especially with all the cake that will be around for days! TOP TIP: Organise an office bake sale and sell slices of all those great cakes and desserts, advertising that all the proceeds will add to your pre-set up Christmas Party bar tab. All I want for Christmas… Displaying these presents out in the office for everyone to see is a guaranteed way to get everyone excited during those last few days of work. Wait until the afternoon before your big office Christmas party, when everyone’s excitement is at its highest, and then you can all finally open your presents and spread Christmas spirit to each and every one of your colleagues in preparation for the night ahead! TOP TIP: Why not be creative with your presents and get your Secret Santa some gorgeous accessories to wear that evening at your office party, or maybe a small bottle of wine for whilst they’re getting ready! If you’ve volunteered for the task of organising your work’s Christmas do for the first time, we know that trying to coordinate a large group of people to enjoy themselves, some of whom you may not know, can be daunting. However, there are some simple steps to take to ensure a pleasant evening for everyone concerned – even you! Communication is essential to spare yourself endless repeated questions from your guests. “Where is the venue? When do we have to get there? Can I wear jeans? I’m dairy intolerant.” Keep all the details in one place on a company email so no one is left out. Office Christmas’ award-winning personal group portal can also help overcome this problem, find out more on our website. When guests arrive at the venue, set a sophisticated tone to the evening with your choice of reception entertainment. A pumping DJ and flair cocktail barmen can bring out the party animal in everyone before the night has even begun, whereas an elegant string quartet and close-up magician wandering around can extend the welcome drinks without leaving your guests worse for wear before dinner. A light-hearted quiz or round of bingo can also keep guests seated at tables instead of propping up the bar. Short of routinely breathalysing individual guests throughout the evening, there is no sure-fire way of stopping your guests indulging in too much drink, but there are some tricks to delay the inevitable. 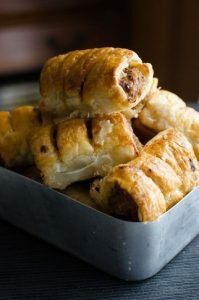 A steady flow of food throughout the evening will soak up some of the booze, so keep canapés coming during the reception and follow the dinner service with a midnight snack of hot bacon rolls. Offering a complimentary selection of wine on tables to accompany dinner can help curb excessive drinking by encouraging people to share between their table and show restraint in front of others. As tables are cleared and the entertainment gets underway, bring out fresh carafes of iced water and glasses for each table so people can help themselves to non-alcoholic refreshment throughout the night. If you’re generously offering an inclusive drinks package, consider making this strictly beers, wines and soft drinks only. No one will mind if spirits aren’t included, and it’s common practice across the majority of events not to do so. At the end of the night, laying on transport is a simple way of clearing guests out of a venue – no one wants to miss the last coach home! There will inevitably be some guests who do, so be prepared with local taxi numbers to pick up the last few stragglers who need help getting home. If your venue is in the centre of the city and you’re worried about guests slipping away early to hit the town, consider staging a prize draw or raffle towards the end of the evening to keep guests at the venue. With this in mind, any important speeches or announcements would be best made earlier in the evening to ensure a full and attentive crowd. Most importantly though, put down that clipboard, leave your comms radio at home and enjoy the party yourself! How Much Is Enough For The Christmas Party Budget? For groups joining a shared party with lots of other companies sharing the evening, you can expect to achieve a three-course seated dinner or buffet followed by a DJ for dancing til the early hours. At this price point, you could only consider the off-peak Sunday – Tuesday nights but this is great news for companies in the retail industry whose weekends are key trading periods. Live entertainment options become available to groups in this price bracket. A live party band, themed performers or fun casino tables may be a feature of the party. Or if that’s not your thing, you’d certainly want to look for a complimentary reception drink or half bottle of wine to be included with your meal. Vibrant themed parties including lots of live entertainment and eye-catching decor fill this category as the best-loved Christmas party themes are produced with great style. Enduring popular themes such as Winter Wonderland, Viva Vegas and Murder Mystery can be booked in quality four and five-star hotels. Unlimited beer, wine and soft drinks also become a key attraction for non-themed parties. From this price bracket, you can expect quirky one-of-a-kind themed events with high-end production and exquisite dining. Fully inclusive drinks, live entertainment and a strictly black tie dress code can be found in stunning locations including grand old museums and landmark buildings across the London skyline. In many ways, a decorated office around the festive season helps to improve morale and inject a bit of Christmas spirit. However, very often our attempts to “jolly-up” our workplace range from the shoddily inadequate, to the slightly gaudy, to the downright garish. For this reason, we’re here to lend a couple of tips about how (and how not) to “festoon your room” this year. Shelves make for a great space to decorate, often taking the place of the traditional Yuletide mantelpiece. However, this doesn’t mean that you need to over-adorn them; remember they still need to meet their primary function as shelves and brittle little ornaments are likely to complicate usage and frustrate your colleagues. Therefore, why not opt for a piece of white felt as a mat and cut the overhang into an icicle shape. These “Shelfsickles” are tasteful and lend a jolly, wintry feel to your files. TOP TIP: Why not add flameless flickering candles to help make the room feel more comforting and cosy!? “Every office needs a tree” say so many people. Sadly, they are wrong. The truth is every office needs a good tree. Many companies fall into the trap of having either a small, over-dressed tree or a big one that is under-dressed. Depending on the area you have to work with, there are some great space-saving alternatives that can make for a stylish addition to your office. If you only have a wall to work with, why not fashion a 2D tree from fairy lights and old pieces of wood? TOP TIP: For the more eco-conscious with a slightly larger space, build your tree from old books and light up! If you find these entrances slightly overbearing or aren’t overly enticed by crepe paper, opting for a traditional Dickensian wreath can lend a homely elegance to your door. TOP TIP: Don’t forget that you can always decorate your door frame as well! Don’t forget to decorate the place that you spend most of your time. A well-decorated desk can help keep your spirits up, improve your work efficiency and help make the day fly by! This one is completely personal and can be as minimal or monumental as you see fit. When it comes to smaller spaces, why not get creative? We love these paper trees, made by stacking progressively smaller pieces of thin card on top of each other over a skewer, and sticking a star-shaped piece on top!